Looking for a relaxed holiday amidst nature in Corfu? 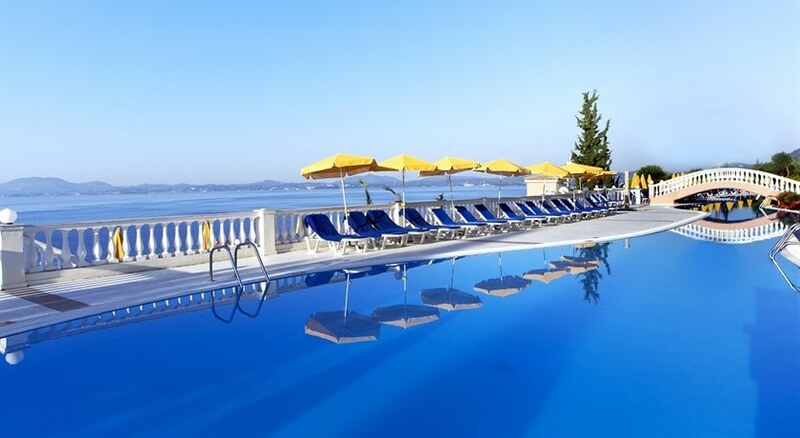 Check out Sunshine Corfu Hotel & Spa in Nissaki. This is an all-inclusive hotel that features four-star services and facilities. It is mostly visited by couples, honeymooners and families looking for a peaceful seaside holiday. Double, bungalows and suites are the three categories of accommodations in Sunshine Corfu Hotel & Spa. Furnished with private balcony, these rooms offer views of the sea, pool and the garden. Bedding option is mostly double and twin beds, depending on availability and your selection. But other standard facilities include air conditioning, en suite with amenities, hairdryer, sofa bed, TV with satellite, phone, WiFi internet, mini fridge and safe deposit—you might have to locally pay to use some of the room facilities. You can request for an extra bed or a crib, but housekeeping and fresh towels and linens are provided every day—suites come with better views and more facilities. Dionissos is the main restaurant that serves breakfast, lunch and dinner in international buffet style. Breakfast is continental with plenty of choices, but at lunch and dinner you will find progressive-contemporary items made of local and international items. Plenty of drinks are serves at lunch and dinner, to compliment the flavours. The restaurant also features kids buffet corner and organises theme dinners every week—such as Italian, Greek, and international cuisines. The Zorbas Taverna is a speciality restaurant that serves exclusive Greek items; meanwhile, the Mamma Mia Restaurant presents authentic Italian cuisine, such as pizzas, pastas and salad. Do check out the Sunshine Bars located next to the pool. It serves an array of fancy mixes and infusions, juices and shakes and light bites. Do note that timings may vary according to the weather and prior reservation is mandatory to dine in a la carte restaurants. There are two swimming pools on perched across two different levels with plenty of sunbeds and umbrellas. Day entertainments are regularly organised, such as aqua aerobics, water gymnasium, water polo, fitness programmes and more—food and drinks are served around the pools. You can play table tennis, pools, darts, beach volleyball, tennis and etc. while the kids join the mini club to meet new friends and engage in various workshops and activities. You can also use the well-equipped gym or visit the spa to rejuvenate your body mind and soul. The spa features Jacuzzi, sauna, vichy shower, herbal steam bath, relaxation area, massage rooms and more. The evening animations are fun as the hotel organises various live events such as dance programmes, games, live music and other engaging activities. Built right on the beach, Sunshine Corfu Hotel & Spa is a four star hotel that features 322 guestrooms. It is located about 500 metres from Nissaki, the north-eastern part of Corfu. You will find some shops, restaurants and bars within walking distance. This is an ideal destination for a relaxed holiday, as the hotel is surrounded by lush pine trees and is secluded from the bustling urban commotions. The beach is right below the hotel where you can swim, snorkel, scuba dive or go fishing. The Corfu city centre is about 25 km from the hotel but there is good bus service to smaller and nearer towns such as Ipsos amd Kassiopi—the Kapodistrias Airport is 25 km away.